There is always one - and only one matching symbol between andy 2 cards in this game. Spot it and you win. 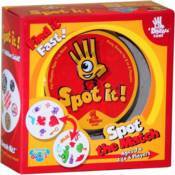 A sharp eye and a little bit of speed is all it takes to play the 5 quick party games included in this tin.